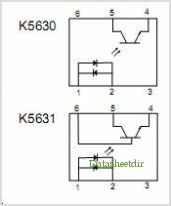 K5631 datasheet, Pinout ,application circuits Photocoupler(these Photocouplers Consist Of Two Gallium Arsenide Infrared Emitting) Korea Corp.
Photocoupler(these Photocouplers Consist Of Two Gallium Arsenide Infrared Emitting) Korea Corp. These Photocouplers K5630 K5631 consist of two Gallium Arsenide Infrared Emitting Diodes and a Silicon NPN Phototransistor in a 6-pin package. By Kodenshi Korea Corp. This is one package pinout of K5631,If you need more pinouts please download K5631's pdf datasheet. K5631 circuits will be updated soon..., now you can download the pdf datasheet to check the circuits! K5631, Photocoupler(these Photocouplers Consist Of Two Gallium Arsenide Infrared Emitting) Korea Corp.
K5641, Photocoupler(these Photocouplers Cosist Of Two Gallium Arsenide Infrared Emitting) Korea Corp.
K5620, Photocoupler(these Photocouplers Cosist Of A Gallium Arsenide Infrared Emitting) Korea Corp.